CSF just recently released the brand new condenser for Jeep & Ram and it is already selling fast! 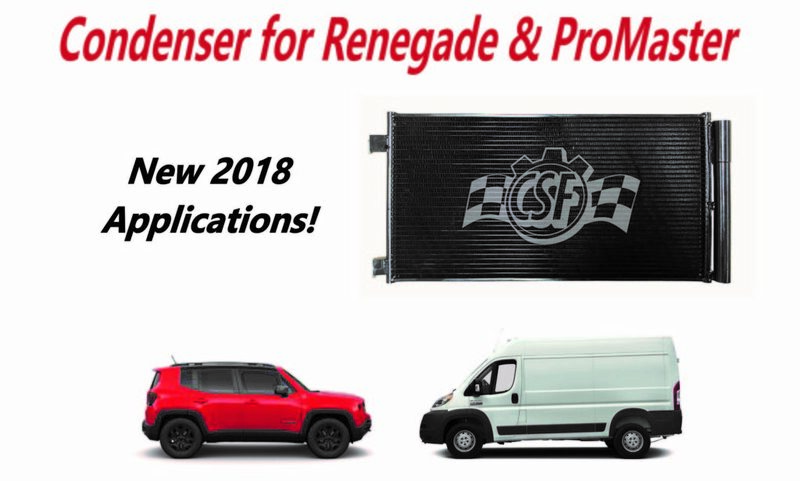 CSF10857 fits the 2018 Jeep Renegade Condenser & 2018 Ram ProMaster Condenser. Don’t miss out on this popular model! The Cooling Experts at CSF Radiators offer a wide array of cooling solutions for most popular makes and models. From radiators and condensers to intercoolers and hybrid inverter coolers for electric vehicles we have you covered through all the stresses and pressures of the road. This entry was posted in Condenser, Dodge, General, Jeep. Bookmark the permalink.